Norris has been in the real estate business in Washington, D.C., for over 30 years. He has served on the Alumni Association Board of Directors on the finance and investment committee. His latest assignment is the Alumni House expansion committee and participating in the construction of the beautiful new Alumni House. Todd has served as a committee member for the For the Bold Washington, D.C., campaign as well as multiple Alumni Association auction events. 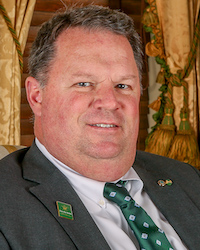 He co-chaired the Class of ’86 15-year, 20-year and 25-year gift campaigns, and has been involved in Tribe Club and Raymond A. Mason School of Business. He spends fall Saturdays watching the Tribe football team, where his son Brooks ’18 is wrapping up his career as an offensive lineman. His sons Tyler ’20 and Bennett ’22 are current students at W&M and his wife Jennifer and high-school-aged daughter Emma cheer them on as well.